I'm going dark blue in today's post with Essie's After School Boy Blazer. Similar to the Essie color Wicked as discussed in my previous post, this polish has a myseterious quality as it appears to be black, but also contains hues of blue. In fact, the hints of blue are most prominent in the light as it picks up the color on the nails. This polish is rich, highly pigmented and leaves a nice shine on the nails. Definitely a great color to wear in the winter months. When applying this color, I recommend applying two coats of polish in order to produce a nice even and sleek finish on the nails. If you are are interested in wearing a dark color on your nails, but you don't want to go entirely black, this color would be a good option to try out since it's a more of a dark navy blue on the nails than a true black. 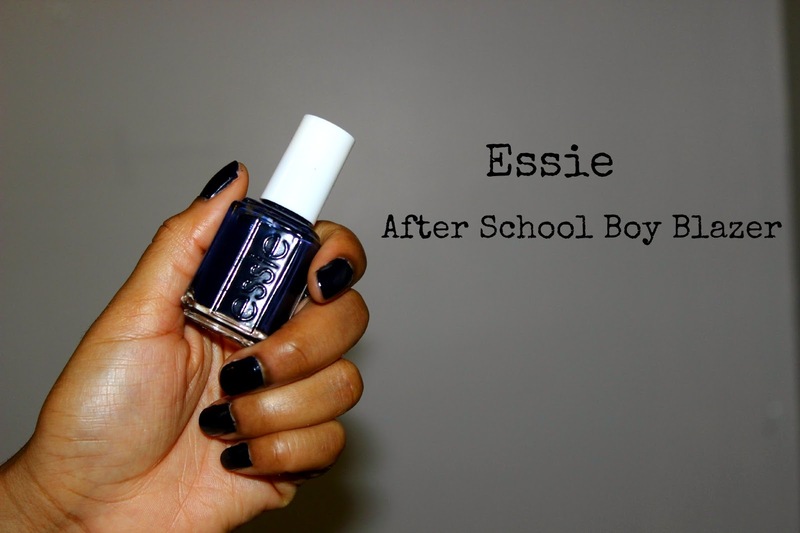 Overall, Essie's After School Boy Blazer is wonderful rich color that looks great on all complexions. Do you like to wear dark polishes in the Fall?